We are going to concentrate on silver in this update, because that is where we see the most extreme positions on the COT and Hedgers charts. 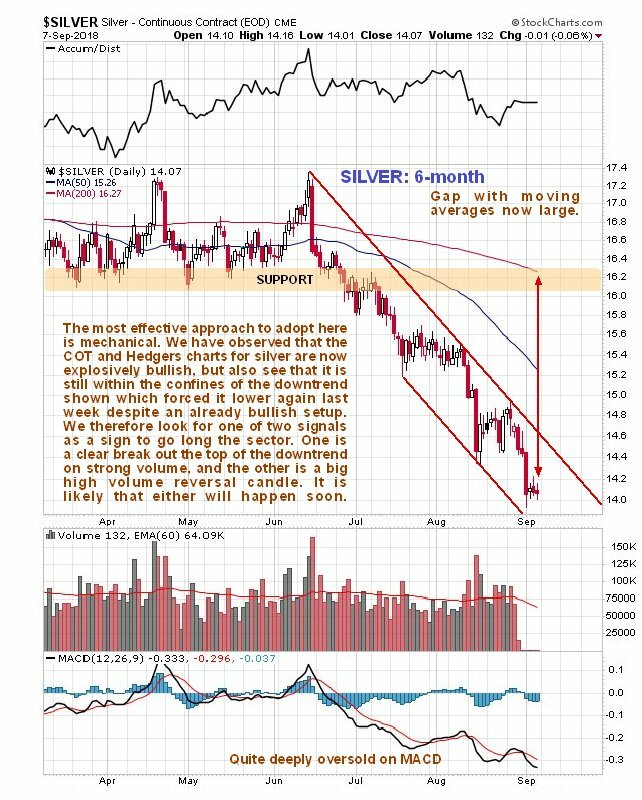 Starting with the 6-month chart for silver, we see that just going on the silver price chart alone, it still looks awful, with the price breaking down into another downleg last week within the downtrend shown. This downtrend will continue until it doesn’t and while that doesn’t sound very helpful, we can be perfectly clear about the two things to look out for as a signal of a reversal – one is a clear breakout from the downtrend on strong volume, the other is the appearance of a big white reversal candle, again on strong volume, regardless of whether this candle breaks it out of the downtrend or not. Latest COTs and Hedgers charts indicate a high probability of either of these technical developments occurring soon. 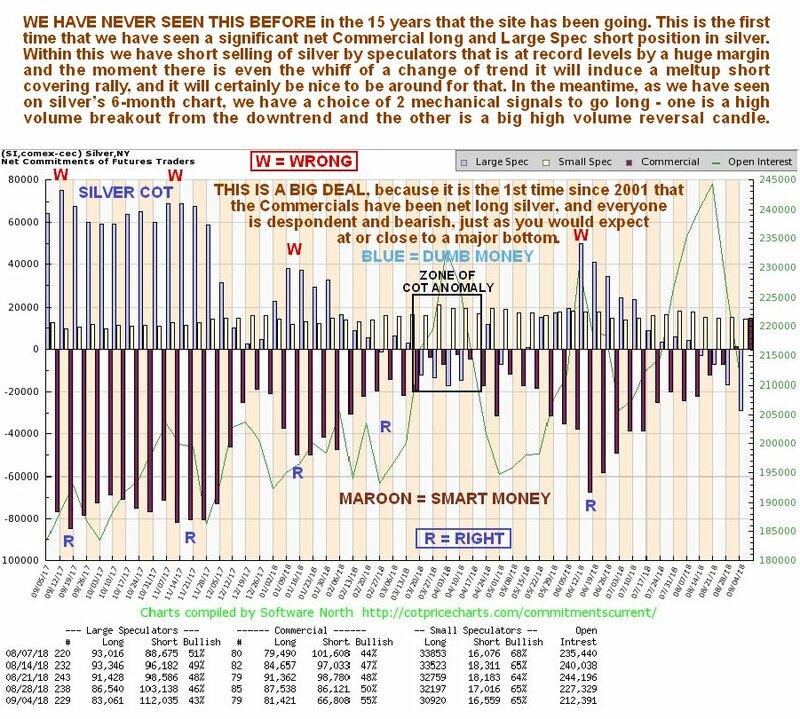 Now, you might fairly say “Well – silver’s COT chart was also strongly bullish back in the Spring, looking similar to now, and nothing came of it – worse it turned out to be a trap.” True, but there was one big difference, which was that gold’s COT was definitely not bullish back then. Now, as we will see below, it most definitely is, and gold therefore looks set to rally along with silver. 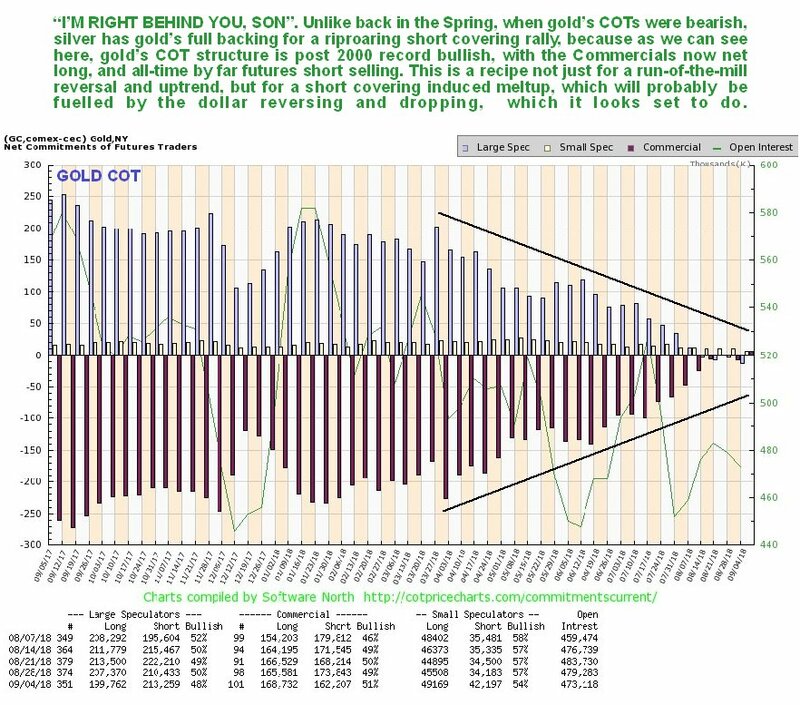 Gold’s latest COT chart shows that the Commercials are starting to go long for the first time since at least 2001. 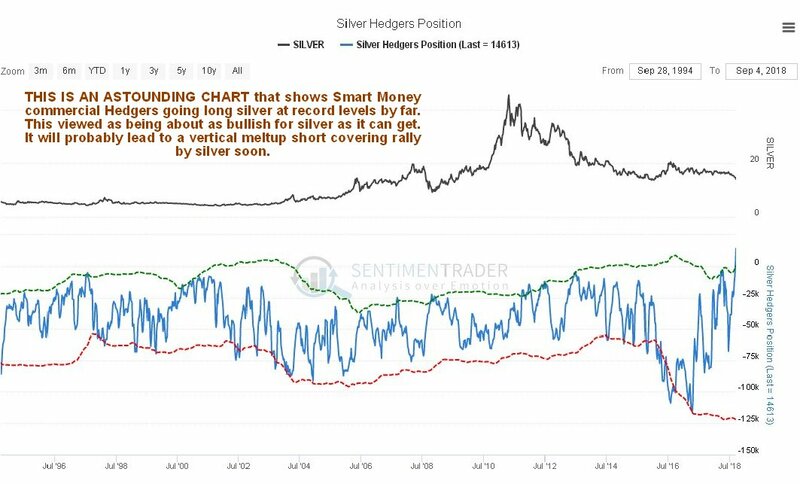 This is a very bullish indication indeed and gives added weight to the strongly positive COT and Hedgers charts for silver. You might argue “Why can’t the pendulum keep swinging in the other direction until the Commercials have built up really big long positions and the Large Specs have built up very big short positions?” which is on the face of it a reasonable argument. The first point to make regarding this argument is that they have never done that in all the time we have been watching these markets, and a second crucial point is that, not shown on these charts, futures traders have built up massive record leveraged short positions in both gold and silver, that far exceed previous records, and as Adam Hamilton has just pointed out in his timely if long-winded update Record Gold / Silver Shorts! gold futures speculators can create up to 39.3X leverage and silver futures speculators 21.2X. This enormous leverage is what has driven gold and silver lower and lower in the recent past, but don’t forget that this leverage works both ways, and as soon as the metals turn up the prospect firstly of their profits quickly evaporating and them then facing wipe out will act as a powerful motivating factor to drive a tidal wave of short covering leading to a dramatic spike in gold and silver. It is a lonely road being bullish on gold and silver now and actually buying takes real courage, yet it surely makes far more sense now with indicators and sentiment at extraordinarily bullish extremes than it did say a year ago. If you buy silver investments at this juncture it is like being Colonel Mortimer (Lee Van Cleef) in the film For a Few Dollars More where he walks calmly up and strikes a match on the face of the hunchback sat at the bar in the smoker scene, who we can take to represent those shorting silver on the futures markets. It’s a high risk play, because the hunchback, surrounded by his fellow gang members, looks like he is bound to win, but as the British SAS like to say Who Dares Wins, and Colonel Mortimer gets away with it. Anyone thinking that the hunchback (those shorting silver on the futures market) later comes out on top, should see what happens to him in the 2nd smoker scene. Posted at 9.00 pm EDT on 8th September 18.